Getting ‘Ink,’ also known as getting a tattoo has been around for countless decades. But, what do you do when the tattoo of your dreams turns into a nightmare? That’s right, you remove it and the following will tell you the best ways to clear your canvas. Why are people searching for ways to remove their tattoo? The answers vary, individuals may want to remove their tattoo because of having allergic reactions to the ink itself, many want to remove a tattoo because they are seeking or obtaining new employment, others have regrets about their tattoo choice, lastly, some want to replace the old tattoo with a new one. Ami James and his masterful crew of artists at Wooster Street Social Club, better known as the cast of TLC’s NY Ink, make tattooing look super easy both for the artist and client. But, anyone who has a tattoo will tell you that this art-form can sometimes be painful and grueling, not to mention the long hours that can go into creating your form of self-expression. 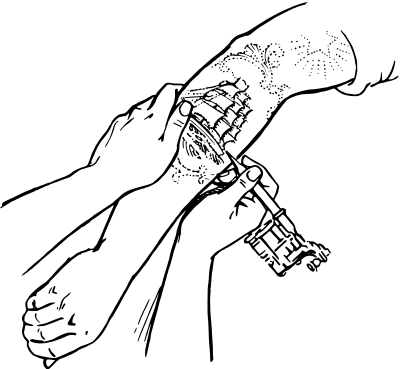 Here’s what to do if you, however, want to remove your tattoo. Many tattoo enthusiasts suffer from ‘tattoo regret,’ in fact, the number of people undergoing laser tattoo removal increased 43 percent from 2011 to 2012, according to the American Society for Aesthetic Plastic Surgery (ASAPS). Speaking of laser tattoo removal, this is one of the three options that is available, along with dermabrasion and surgical excision. Surgical excision – also called surgical removal – is a more invasive option for tattoo removal. The dermatologic surgeon removes the tattoo using a scalpel and closes the wound with stitches. 1. You now know about the various techniques that can be used to remove an unwanted tattoo, now let’s delve into what else you need to know. For instance, no matter the price, finding the right doctor is crucial if you want your tattoo removal to be a success. Simply choose a doctor who is qualified to perform tattoo removal procedures, such as an ASDS (American Society for Dermatologic Surgery) dermatologist. 2. You have a critical part to play in your tattoo removal process, as well: Take care of yourself before and after your treatment. Follow all pre-and-post operative treatment procedures carefully. And, don’t walk away from your doctor if there are still looming questions that need to be answered. Doctor’s orders! 3. Since your first attempt at creating a great tattoo wasn’t successful, it’s time to have things done your way by erasing it from your skin. Discuss with your doctor the reasons why you want your tattoo removed and the expectations you have of the process. 4. While it’s important to have only the ‘best of the best,’ in terms of doctors treat you, you should educate yourself on what your removal costs will be. Know this procedure is considered a cosmetic or aesthetic procedure and typically is not covered by medical insurance. 5. Are there some who should not consider tattoo removal? Yes. Those who should not opt for this procedure are individuals with certain autoimmune system disorders, active acne, pigmentation problems, warts, unstable diabetes, active rosacea or other undiagnosed lesions. Just inform your doctor of any concerns you may have. 6. If you plan to get a new tattoo to replace the old one, take a step back. Make sure that you truly want this design on your body in say, 20 or 30 years’ from now. Ask yourself: Do I really want a permanent reminder of what may possibly be a temporary feeling? Well, there’s your answer. The time, the money, the pain. What one may think is cool today may not necessarily be the case tomorrow. Thankfully there are ways to make your tattoo a little less permanent. This entry was posted in Celebrities, Health, Lifestyle, Poll, Safety, Self-Help, Statistics, Technology, Uncategorized and tagged 'Tattoo Regret', American Society for Aesthetic Plastic Surgery, American Society for Dermatologic Surgery, Ami James, ASAPS, ASDS, Dermabrasion, Laser Surgery, Surgical Excision, Tattoo, Tattoo Removal, TLC, YouTube. Bookmark the permalink.